Last night I attended another house concert at the home of my friends Dave and Jacqui. (You can read about the first gig in a previous post.) They’ve always been huge music fans. Now that they’re semi-empty-nesters, they took the plunge and started booking gigs into their home – nearly one a month throughout the year, in what they call their Parlor & Patio series. Wicked Peace was band performing last night (sans their drummer – it’s a house concert after all). They’re just a bunch of kids from this hills and hollers… Kentucky for most of them, and West Virginia for one. The lead singer Tanner and guitarist Patrick met in 2013 when they lived next door to each other in the dorms at Morehead State. Started jamming, started writing. Lead singer conscripted his older sister Amanda as a second vocalist and additional songwriter. They nabbed their bass player Jared from the music program at Morehead, and found their drummer Matthew in their new home base of Lexington. It’s a family affair – in addition to the brother-sister lead singers, Amanda’s husband Adam is the band manager/booker, does album and poster artwork, sells merch, helps direct their videos… heck, he probably changes the oil on the van too! 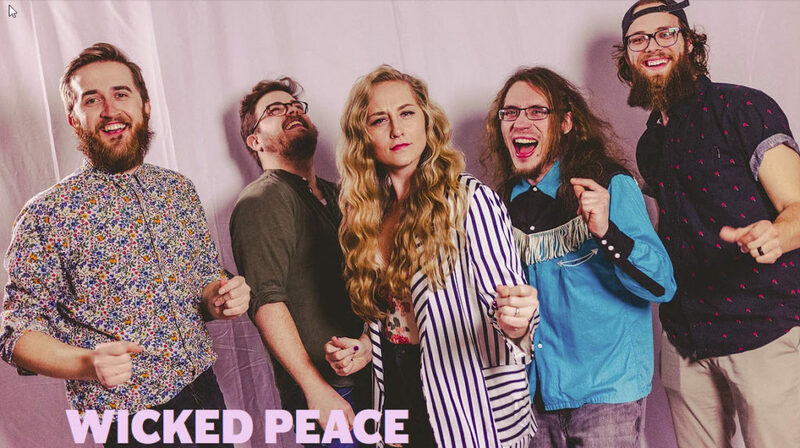 Wicked Peace did a very nice set of tunes… some songs sounded a bit like Houndmouth, and Amanda’s voice is like a Southern Sandy Denny. The show included a tasty “pie break” intermission, where Dave and Jacqui served up free slices from a great local bakery called Piebird. Great music, gracious hosts, an attentive (no cell phones allowed) and appreciative audience… and pie. What could be better on a beautiful Friday night in the spring? Nothing! You can check out Wicked Peace’s videos here.